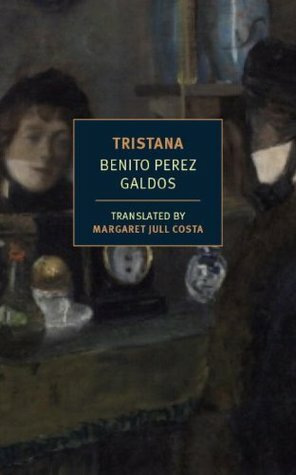 Tristana from Benito Pérez Galdós (1843-1920) is a subversive novel that takes a sly look at the power structure in the relationships of its three main characters: Don Lope, an aging, dissolute roué, his ‘ward,’ the beautiful Tristana, and the handsome, wealthy young man she falls in love with, a painter named Horacio. This is the sort of novel guaranteed to elicit a range of responses from its readers, and that would make this relatively short book, clocking in at just under 200 pages, a great choice for book groups who’d like to sink their teeth into complex characterisations and slippery morality. The first time I encountered this gentleman and observed his proud, soldierly bearing, like a figure in a Velázquez painting of one of Spain’s regiments in Flanders, I was informed that his name was Don Lope de Sosa, a name with more than a whiff of the theatre about it and worthy of a character in one of those short tales you find in books on rhetoric; and, that, indeed was the name given to him by some of his more unsavoury friends; he, however, answered to Don Lope Garrido. In time, I discovered that the name on his baptismal certificate was Don Juan López Garrido; so that sonorous Don Lope must have been his own invention, like a lovely ornament intended to embellish his person; and the name so suited the firm, noble lines of his lean face, his slim, erect body, his slightly hooked nose, his clear brow and lively eyes, his greying moustache and neat, provocative goatee beard, that he really could not have been called anything else. One had no alternative but to call him Don Lope. Even though Don Lope Garrido (and the name is explained in the footnotes) is 57, it’s still possible to see this dapper aging womanizer as the dangerous threat he used to be. Some of the measures he takes to hang onto the shadow of his vigour are laughable. The age of this excellent gentleman, in terms of the figure he gave whenever the subject came up, was a number as impossible to verify as the time on a broken clock, whose hands refuse to move. He had stuck fast at forty-nine, as if an instinctive terror of the number fifty had halted him on the much feared boundary of the half century. He’s spent his lifetime pursing women while evading the consequences of his actions, but now living on an “ever-decreasing income,” he floats on his past glory as a supreme seducer of women with a manufactured morality “which, although it seemed to have sprung solely from him, was, in fact, an amalgamation in his mind of the ideas floating around in the metaphysical atmosphere of the age, like invisible bacteria.” The situation with Tristana is perfect for Don Lope. She’s beautiful, innocent enough to fall for his manipulative arguments and as his ward, she’s entirely dependent upon him. So there, in a few quotes, is a lot of information about Don Lope, who, IMO is the main character of the book–in spite of the fact that its title is the name of Don Lope’s ‘ward’ Tristana. The term ‘ward’ is applied sarcastically as beautiful, young Tristana, who fell initially into Don Lope’s power through the poverty of her parents and Don Lope’s generosity, is her guardian’s mistress. Locals theorize that Tristana is Don Lope’s niece or even his daughter (“there were even some who claimed to have heard her say ‘papa’, just like one of those talking dolls”), but in time it becomes clear that “she was nothing […] an item of furniture or an article of clothing, with no one to dispute his ownership.” Tristana, who has a great deal more power than she realizes (or is able to exercise) is, however, the celestial body that the other two main characters, Don Lope and Horacio orbit. Too young and naïve to initially understand her vulnerability, she grasps her situation in her guardian’s home too late, and when she begins to put up resistance to Don Lope’s despotic power, he, a lifetime seducer of women, unscrupulously checkmates her at every point. The domestic situation in Don Lope’s house is at once bizarre and pathological, and gradually as the story develops we see how Tristana was initially under Don Lope’s thumb and how she now chafes under his control. Don Lope, once the great seducer, entranced women with his words, his wiles and his caresses, but now he alternates various roles to keep his control on Tristana, his “last and, therefore, dearest trophy,” so in one moment, he sits her on his knee and fondles her, and in the next he’s her caring, but authoritative parent who sends her to her room. This leaves Tristana, who’s a neophyte when it comes to manipulation, always one step behind her aging lover/protector/guardian, and while she knows she’s being manipulated and used, she can’t ever quite challenge the various arguments that seasoned seducer Don Lope sends her way. As a result, her resentment and desire for freedom grows, and then she meets Horacio, a young painter who understands her plight…. There were so many ways this novel could have ended, but Benito Pérez Galdós delicately constructs the most subversive route to his story’s conclusion. There’s love and tragedy but there’s also irony, domestic comedy and the massive egos of two of the three main characters, and that’s as much of the plot as I’m prepared to discuss. A section of the novel takes the form of an epistolary as mushy love letters pass back and forth between Tristana and Horacio. At this juncture the novel lost some of its momentum, and yet at the same time, these letters were essential to question the nature and authenticity of love while showing how the three characters inhabit necessary roles for each other. Tristana and Don Lope eventually become almost caricatures of themselves while Horacio, always a lesser player in the game, does not. Balzac was an enormous influence on Galdós and you can see this in Tristana in the way the author gently dismantles the layers of his characters with each new event as jealousy, rivalry, and tragedy challenge the triangular relationship between Don Lope, Tristana and Horacio. In this parable of power, self-deceit and ego, who will emerge the victor? And what will victory look like? Don Lope, the seducer, Tristana, his victim, and Horacio the lover begin by inhabiting the lives stock characters, but as the tale continues and the layers of this tale unfold, Galdós does not let his reader make easy moral judgments. Outstanding. I must read this novel, someday. Fortunata and Jacinta was excellent in many ways, but exhausting. This is easier to handle. I think this is the first translation, so cheers to NYRB. A fascinating novel certain to spark many different reactions. Tremendous stuff, Guy. I love the quotes you’ve included in your review; they’re very evocative and convey a vivid image of Don Lope. Good to see Margaret Jull Costa’s name on the translation as she’s one of my favourites. Another reason to add Tristana to the wishlist. I’ve seen Margaret Jull Costa’s name a lot, and you know that anyone NYRB gets will be good. Her Javier Marias translations are wonderful. I’ve read a couple and would like to try others next year. I had not heard of Benito Pérez Galdós. I always like it when an author takes characters away from the cliched and the expected. Don Lope Garrido sounds like a lot of real life people who control and manipulate others. There’s a lot of philosophical topics to chew over here, Brian–including the meaning of Happiness. A nice review. I’m reading through Costa’s translation now and thoroughly enjoying it. It’s my second time through, having read Colin Partridge’s translation a couple of years ago. It’s a wonderful tale that seems to frustrate a lot of people (especially in Galdos’ time) because of the difficulty in drawing any moral judgments. It has definitely become a favorite of mine. Ok, so there is another, earlier, translation, then. There was, but it was published by Edward Mellen Press, so usually only available in college libraries. The nice addition to Partridge’s translation, though, was an analysis of the novel to Bunel’s adaptation of the novel (a movie I highly recommend, too, if you haven’t seen it). Speaking of happiness, Jeremy Treglown spends a lot of time in the introduction talking about the ending, and he doesn’t raise the interpretation I walked away with. OK, I’ll have to post now on the book! Galdos’ ambiguity provides a large part of the joy I have in reading him. I don’t always agree with the introductions. Sometimes I even wonder if those writing have read the book. I have seen the film (I’m a Bunuel fan) and what a totally different animal it is. I’m liking the sound of this one.. I usually enjoy books with slippery characters and this one seems particularly well crafted. There’s a lot to like here. I hope you try it. I wasn’t familiar with this author but it sounds very good. For some reasons I have the feeling there is a movie. Could that be? Another NYRB winner. Yes Caroline, you are right. There’s a Bunuel film starring Catherine Deneuve but apart from the set up & the characters’ names it’s nothing like the book. The book has a generosity to its characters that the film lacks, plus the film is loaded w/religious imagery. Of course. I’ve seen it., I knew it sounded in some ways familiar. I would have guessed that you’d seen it as you like Bunuel, don’t you? Tantalizing review, Guy, as much for your fun post itself as for those great Galdós quotes about Don Lope “having stormed more bastions of virtue and captured more strongholds of chastity.” I only know the story from the Buñuel movie alas, but I hope to get to the author next year since it doesn’t look like it will happen this year. Anyway, nicely done! Thanks Richard. The book is NOTHING at all like the film, and they’re so unalike, it’s quite astonishing really as Bunuel certainly placed his own unique interpretation upon the book. The book is slyly funny and very generous to its characters, but the film is … well .. you know. Outstanding, Tom’s word, sounds right. This sounds absolutely great, slippery yet well written. I love that first quote about the rooms too. Definite TBR material. Nice find Guy. Yes Max this is one I’d recommend for you. Have you seen the film? Haven’t even heard of it. Who’s the director? It’s Bunuel and totally different from the book. The names and set up are the same but that’s about all. Great book- he is a very funny writer! Can’t wait to read more of him. Rey was perfect as Don Lope, you must admit! A terrific book and a terrific review of it. This definitely goes on my “top books read in 2014” list for numerous reasons, not least of which is the author’s effort to plumb the complexity of his characters and for the sharply ironic yet tender manner in which he does it. I also appreciated it as a novel that delved into the conditions necessary for creativity, and the various obstacles to fulfillment of promise. I’m going to think about your having proposed Don Lope as the main character; he’s certainly the embodiment of many of the targets of the author’s sharpest barbs. Yet it’s that refusal to judge that makes this such a delicate portrayal. Now you’ve got me wanting to read it again. Have you see the film version, Scott?